Comments: Comments Off on The Rangers should sue Bud Selig for gross stupidity. The Rangers should sue Bud Selig for gross stupidity. If the Rangers end up losing the World Series tonight, they can thank Selig. It was his inane idea to tie the home field advantage in the series to the winner of the all-star game. If they had home field advantage like they would have had under the old system, the series would likely be over and they would be celebrating a title. Definition – (1) To screw up something that without intervention would have been much better. (2) To do things just for the sake of change despite the lack of need for any alternation. It would be bad enough if the Cards were a division winner and got home field with a worse record than the Rangers. But this team fell backwards across the line into the playoffs as a wild card team. In no other sport does something as stupid as an exhibition game determine home field advantage. What would baseball have done if the 2011 game had ended in a tie like it did several years ago? Knowing Bud, they would have had the first 4.5 innings in St. Lewis then moved to Texas for the last half of the game. If the brain-trust of baseball is wondering what they can do to improve the respect writers and fans have for their sport, I have a suggestion. Forget this stupid rule. 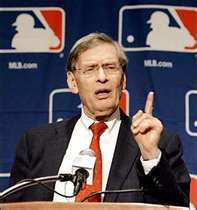 And by the way, don’t let Bud do anything else to “Selig” the sport. Baseball needs to upgrade Umpires NOW! MLB’s reputation has taken major hits from the steroid scandal, missing the playoffs because of a strike and leadership of the some times blind but always intellectually challenged Bud Selig. But there is a bigger problem with the game—the ineptness of some of its umpires. Umpire Marty Foster covered 3rd base last night sort of. At least he was paid to do that. In the first inning he called Derek Jeter attempting to steal 3rd. The ball got there in time but Jeter was never tagged. Jeter complained to Foster and was reportedly told that he didn’t have to be tagged to be out. When Jeter told Yankee manager Joe Girardi what Foster had said, Girardi exploded and got thrown out of the game for arguing the call. Maybe someone should buy Foster a copy of the MLB rule book. Even if they did, I doubt he would read it. The umpires were already under the gun for inaccurate ball and strike counts. New technology has proven beyond a shadow of a doubt that umpires are not able to tell a strike from a ground hog. Baseball has always said that it can live with a wider than legal strike zone as long as the calls are consistent for both sides. But the only consistency is how inconsistent the calls are. The union is fighting any use of instant replay including the limited use now approved. They want to keep the ineptness of their members a secret. But we all know they are inept. The sport needs instant replay to correct the most egregious mistakes. The umpires are above criticism by players, team managers, and owners. Baseball fines and can suspend those individuals for saying anything negative about the boys in blue. Fortunately, there is nothing that the union can do to me. Unfortunately, there is very little I can do to the union as well. If baseball ever wants to convince people like me that the game is fair, it is going to have to use instant replay to eliminate the stupidity and bumbling calls of their umpires. Balls and strikes need to be called mechanically. The existing technology can do that as fast as the umpire behind the plate but with total accuracy. Errors in calls on the bases need to be corrected real time as well. The game deserves better. The players that work so hard hopefully with out the assistance of steroids deserve better. Most of all, the fans that pay to see the travesty laughingly referred to as MLB and those that buy the products that support the game deserve it as well. Unfortunately for all those people, the Umpire Union is so strong that instant replay will never be used beyond those approved now. In fact, look for the union to negotiate that use out of their next contract. Baseball and politics don't mix. Baseball and politics don’t mix. If you have ever wondered if government can screw up something innately simple, just look at the people to whom it gives drivers licenses. Congress got involved in the baseball steroids controversy several years ago. The House and the Senate held hearings and drug (pun intended) players and members of the league and the union in front of TV cameras in the worst reality show in history until “Hole in the Wall” aired last year. But even bad TV has its moments. How entertaining can it be with the “Day of the living dead” Sen. Arlen Specter as host? Who among us doesn’t get choked up hearing Rafael Palmeiro say “I have never used steroids, period.” Of course that would have been a little more moving had he not been suspended for steroid use less than 5 months later. Now Congress is way too busy pounding trillions of taxpayer money down a rat hole to be involved with baseball or steroids. But fear not. Another branch of government is stepping in to take Congress’ place—the Courts. Miguel Tejada faces a court date Wednesday because he lied about steroid use. No, not his own. He is expected to plead guilty for lying about steroid use by other players. Because the final sentencing of Tejada might not be done until May, his availability for the Astros season might be in jeopardy. Odds are that he will not get prison time for refusing to throw his fellow players into the teeth of the congressional grinder based on hearsay. The crime is a misdemeanor not a felony. But Tejada is a Dominican and is here each season on a work visa. It is possible that his visa status might be affected. At the very least, I suggest that fantasy baseball players be aware of his legal situation. Our old buddy Bobby “quick hit of steroids” Bonds is facing perjury charges for lying about his own recreational use of the juice. He can expect to get some quiet time in jail. Given how much the press and talk radio have hounded him, he could probably use the rest. There is no question that a large number of players are guilty of using steroids but both Bud Selig and Don Fehr deserve to be fired for their joint efforts to hide the problem under the biggest rock available. It is not a sin to be ignorant. It is a sin however to be arrogant about your ignorance. These two have to go. They have done irreparable damage to the sport and the players for whom they have responsibility. Selig closed his eyes to the problem. No one could look at Sammy Sosa or any of the other guys after they got juiced and not be suspicious. This problem should have been dealt with years ago. But after the strike eliminated the World Series, Selig was willing to ignore the evidence in hopes that the home run race between Sosa and McGuire would bring the fans back to the ballparks. Fehr is equally guilty. He reportedly blocked some owners efforts to institute testing well before the 2003 study to determine how extensive steroid use might be. Then he claimed that a federal grand jury investigation prevented the destruction of the “totally confidential” results of the study. Don, I have a feeling that the 2003 grand jury has expired in the last 6 years. You blew it! If baseball wants to really restore public confidence in the game, the owners need to fire Selig and the players need to fire Fehr. SI and the San Francisco Examiner have done a great job digging into the story. It is too bad that the drive bye media doesn’t do the same thing when our elected officials violate the law and the Constitution.